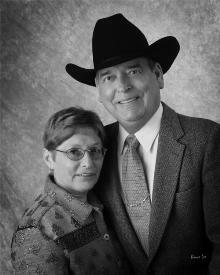 The Minnesota Horse Council announced the selection of Carolyn and Roy Shumway of Ramsey, Minnesota, as Minnesota's HORSEPERSONS OF THE YEAR. The announcement was made at the Council's Annual Meeting on January 22. Shumways, who have ridden and trained horses for many years, are recognized in the equine industry for their outstanding contributions to the recreational tra ils throughout the state of Minnesota. 2004 was the thirty-fifth year of the award. Carolyn grew up in Jasper, MN, and began her riding career on a pony named Smokey. Members of her family were involved in canine field trails. Roy became involved in the horse industry in 1969 when he would field trial German Shorthaired Pointers. The dogs were trained to hunt in the field so horses were provided for rent to assist the trainers and exhibitors in their work. In 1974, Roy bought his first horse and within the next year had purchased thr ee more. Shumways purchased a hobby farm in Ramsey, MN, in 1976 where they currently reside with son Michael. Shumways began training horses for friend s and others who learned of their abilities. They were active members of Ramsey Rangers Saddle Club. Roy served as President for two years; Carolyn served as Treasurer. Their interest in trail riding led them to the Minnesota Trial Riders Association where Roy served on the Board of Directors for two years. Leading and organizing trail rides led Roy to the area of designing trail head facilities and working with the MN Department of Natural Resources (DNR) in the installation of horse trails. His growing interest for trail development led him to organize rides specifically so that donations could help the upgrading of the St. Croix State Forest horse camp. As his involvement with the MN DNR and MN Forestry developed, he was instrumental in the designing and funding of the Tamarack horse camp in the St. Croix Forest; he helped find volunteers to help with the upgrade of the horse camp area. He participated in all initial design phases of the Willard Munger (Gateway Trail) that starts in Minneapolis and will ultimately end in Thunder Bay, Ontario. (Currently horses may enter the trail in Oakdale). The Willard Munger Trail set a precedent with the design and construction allowing broad diversity of trail users on one trail. Later, Roy was responsible for additional matching funds for alterations and repair of this trail. Shumways growing work with trails led them to look for an organization to support the endeavor. In 1989, Roy became a member of the Minnesota Horse Council. In 1990, he became a director and organized a new committee called the Trail Blazers. Under his leadership, the group promoted new trails and horse camps throughout the state by working extensively with the MN DNR on a state and local level. In 1992, he initiated the upgrading and expansion of the West Assembly/Zumbro Bottoms horse camp in southeastern Minnesota. In 1994, he became involved with the Chippewa National Forest. The new horse activity campground there opened to the public in September 1998. Carolyn was elected to the MHC Board in 1991 and served on many committees in addition to helping with the Trail Blazers. Roy resigned from the Council in 2001 due to health reasons. Carolyn retained her Board position until 2002. Roy Shumway was involved in the founding (in November of 1990) of the Minnesota Recreational Trail Users Association (MRTUA), a group working to provide trails for the many diverse trail users by sharing each's specific needs and working together. Roy was elected a director of MRTUA at the organizational meeting and still serves as a representative for the horseback riders and carriage drivers. In 1992, this advisory board and MN DNR administered the National Recreation Trails Act funding for recreational trail acquisition and development. Roy himself has sponsored many trail rides; he has helped saddle clubs and organizations sponsor rides. He has ridden as a safety outrider for two Camp Courage Wagon Trails. He has given lectures at the Minnesota Horse Expo (MHE); he has spoken to many diverse organizations on trail design, horse camp layouts and horsemen's needs. He has produced a pamphlet on trail etiquette, what to take on the trail (for horse and rider), camping list, and what to take on a pack trip in the mountains. Carolyn and Roy Shumway continue to share their knowledge and talents in the equine industry.